Help Keep our Bike Trails Cleared this Winter! Run Muskegon is actively seeking donations from local businesses and citizens to help restore use of the Lakeshore Bike Trail during the winter. Run Muskegon host the Shamrock Shuffle 5k and the Thanksgiving Turkey Trot as the major fundraisers to snowplow the downtown bike trail. Run Muskegon decided to start this project back in 2013 after struggling to find safe running routes in the winter that didn't involve running alongside traffic in slippery and snowy conditions. 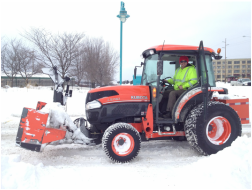 We made it our goal to clear the downtown bike trail that is designated for pedestrian traffic only so that runners and walkers can safely exercise all winter long in the city of Muskegon. Run Muskegon is now a registered 501(c)3 and donations are tax deductible!